Here are some ideas to help you capture interest by creating festive fun opportunities for science enquiry. These activities should tease out children’s current understanding of the big ideas in science but also provide the means to scaffold and develop more secure understanding. 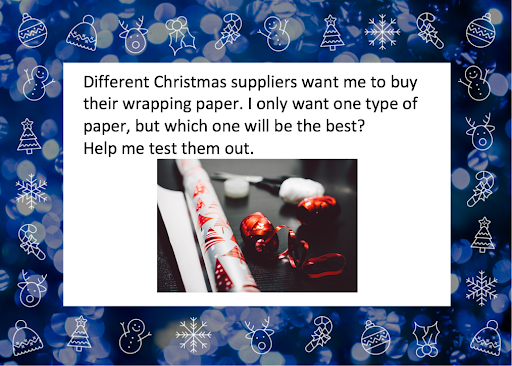 I have created a number of different types of enquiry prompts, based within a festive context, for pupils to address in small groups at their own pace. We all recognise the challenges of managing good quality teaching and learning during the Christmas term! There are often disruptions to cope with, such as pupils being withdrawn from the class for additional choir practice, or even the big Christmas assembly production! 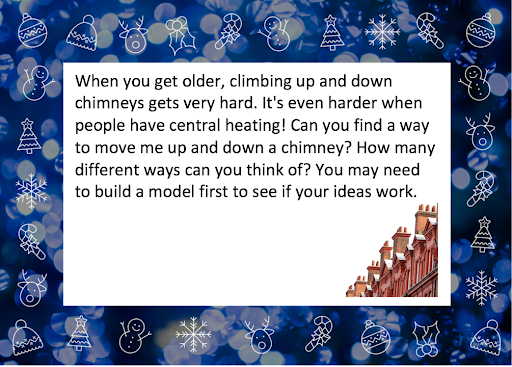 Here are some ideas to help you capture interest by creating festive fun opportunities for science enquiry. These activities should tease out children’s current understanding of the big ideas in science but also provide the means to scaffold and develop more secure understanding. 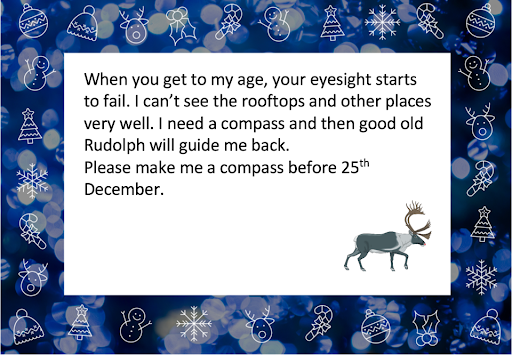 I have created a number of different types of enquiry prompts, based within a festive context, for pupils to address in small groups at their own pace. Each activity idea is briefly described below and identifies the science concept within the enquiry. There is an opportunity to focus on different enquiry skills and grow pupils’ scientific literacy, so they become more aware that how they work in class relates to the way professional scientists might work. Developing a wide range of science enquiry skills and competencies is important. Collaborative thinking, working in small teams and being able to present outcomes for peer review are a few examples of what can be achieved using these activity prompts. The cards provided in the links may be printed for the children to use. This activity provides a great opportunity to think about the centre of gravity. Using a model, such as balancing a potato on a wire coat hanger or using different irregular cardboard shapes, will help children to understand this concept. The pupils can explore freely to find the centre of balance. 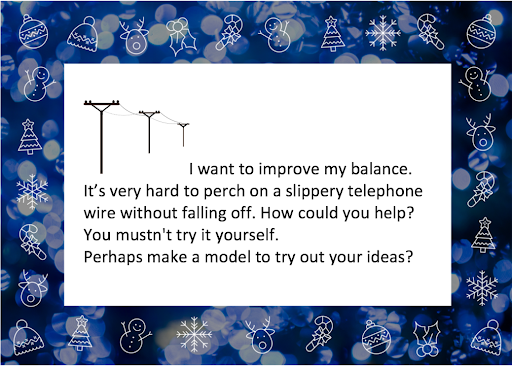 They can then relate their findings to suggest how Father Christmas could improve his balance while walking from house to house on the telephone wires by adjusting his centre of gravity. The enquiry can be made more ‘open’ by helping the children to research the centre of gravity and then find different ways to investigate it using models. Here, the science concept is about understanding friction (forces). 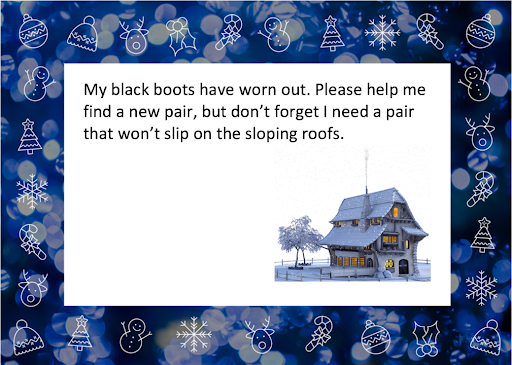 Father Christmas needs high friction boots. The science enquiry process requires a fair testing approaching using a selection of different footwear. The pupils have an opportunity to decide the process, such as creating a ramp and deciding what measurements are required, and how these might be recorded and reported. Encouraging each group to take a different approach provides more interest when groups present findings to each other for review and evaluation. The children could even design the best boot by drawing the outcome of their collective investigations. The focus here is on scientific enquiry and using all the senses safely. Children must look at, feel, smell and listen to each parcel, to make the best prediction and then justify their ideas to others, refining their own thinking through assessing others’ ideas. Obviously, they can’t open the gifts as they are beautifully wrapped and impossible to re-wrap in time! The teacher needs to set up this activity in advance and ensure there is something to challenge each of the senses. 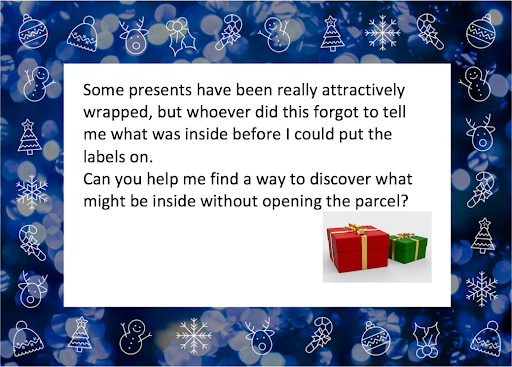 The activity won’t take long, so it could be an additional challenge for the pupils to create a new parcel for another group to work out. The debriefing of this activity is important, as it should focus on how data might be gathered to draw a conclusion. Often, pupils think that ‘data’ is only about numbers and graphs and they underestimate the need to use more of their senses collectively in order to draw better conclusions. The science concept here is about magnetism. This is a closed enquiry, as the task has been decided and requires the pupils to make a compass. However, there are numerous ways this can be done in the classroom and the children could be given a choice. Following instructions and then evaluating the accuracy of the product is a worthwhile aspect of working scientifically. The teacher can debrief the session by discussing magnetism and the Earth’s magnetic field. A great opportunity for the enhancement of scientific literacy is also to discuss: how a compass works and where it points in relation to the geographic north pole; how relevant a compass is to travelling today; and what variations or differences there are in the way that navigation is guided on land, sea, and air. Children could also research naturally-magnetised pieces of magnetite (called lodestone). This activity is about the separation of materials through chromatography. The teacher needs to set this activity out with care. Firstly, it is necessary to find a number of black felt tip pens that will separate out differently. (Place a blob of ink on the bottom edge of filter paper and dip this into water so the water is just below the ink and is drawn up into the paper – different inks will be dispersed differently). Secondly, write each letter so the letters can be compared with the named pens! 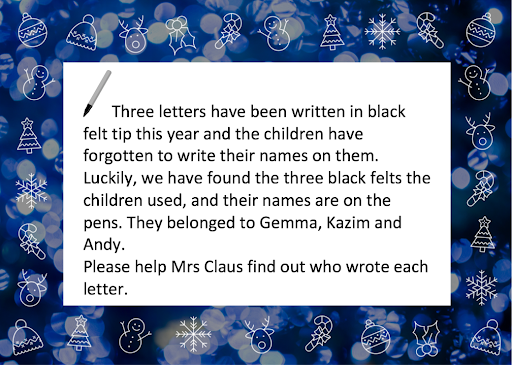 Each group will need to test out each pen and then use the evidence they gather to solve the problem of which pen wrote which letter and therefore deduce which child wrote each letter. The teacher can debrief this session by linking it to real life opportunities, such as how the police use chromatography to solve crimes, doctors use it to identify different chemicals found in blood and urine samples and chemists use it to identify constituents of various mixtures. The science here is determined by what they decide is meant by ‘best’ paper. Best for what? Each group needs to clarify how they view ‘best’ e.g. strongest, or waterproof for example, then design a way to test their samples and control variables, gather data and draw conclusions that provide an answer. They could decide ‘best’ is the most popular, in which case data might be obtained through a survey in which case the teacher can then instigate a discussion about the validity of sample size and discuss the most appropriate way to present data and report it to different audiences. Children could investigate more than one property and then decide that the ‘best’ paper refers to the one that fulfils the most criteria. The science being addressed here is electric circuits and comparing series and parallel arrangements for components in circuits. 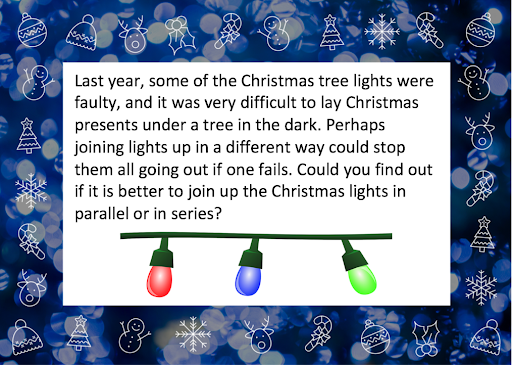 Many cheap Christmas lights have their lamps arranged in series, which means if one lamp fails the circuit is broken and all the lights go out. This scientific enquiry opportunity lends itself to exploring, making and comparing different circuits. Children could even make their own torch for Father Christmas as an extension activity and devise simple switches from different materials like paperclips and foil. The science here is all about simple machines: ‘pulleys’. Two or more pulleys working together will reduce the force needed to lift a load. This enquiry can be approached in many different ways. Consider starting by devising a simple machine of one wheel with a rope, where the direction of the easier pull downwards is used to lift the load upwards. Then move on to investigating the effect of two and more pulleys and describing what occurs in terms of effort and distance travelled. New Resources: Explore Sound with Chrome Music Lab and More!